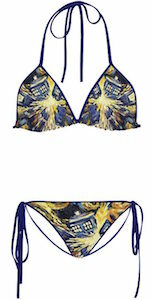 If you like a Doctor Who swimsuit then come check this out. This Tardis bikini may look like a one piece but is actually two pieces and they are sold separately so that you can get it to fit just perfectly or match it with something else you own. The bikini bottoms are high waist and are blue with on it gears and on the back, you find the Doctor Who logo in white. The bikini top looks like the Tardis with the front door and the top sign and it has a ruffle on the bottom to make it look even cooler. The bikini top has straps that are removable so that you can wear it strapless and it looks like a cool top so maybe you like to wear it outside of the water as part of a Doctor Who costume. If you are a Doctor Who fan looking for a fun swimsuit for the pool and beach then you came to the right place as this exploding Tardis bikini set is just what you need. The string bikini has blue strings and besides that the fabric of the swimsuit is covered in the print of the Van Gogh painting of the exploding Tardis so lots of blue and yellow. You can get this special Doctor Who bikini set in many women’s sizes ranging from Small – 5XL so that all the true fans of the Doctor and his Tardis can enjoy wearing it this summer. Sun, sand and the beach all need you to looks at this Tardis bathing suit as it is the perfect swimwear for a Doctor Who fan like you. This women’s swimsuit is Tardis blue and shows the famous doors of the Tardis on it. Now you can be out in the water knowing that the Doctor is keeping an eye on your and that he can make you travel in time and space because he you are wearing the Tardis. 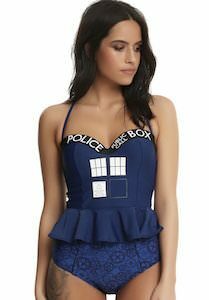 No longer do you need to wear boring plain swimwear because this Tardis swimsuit is just so much better looking and way more fun.